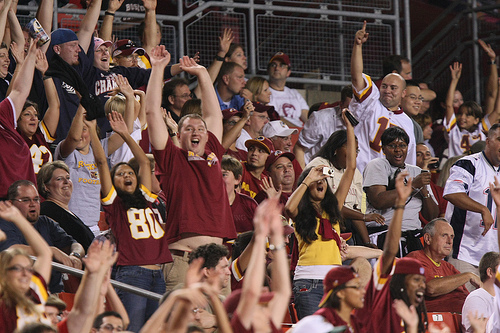 It’s all so simple really, what’s at the bottom of the fight over changing the name of the Washington Redskin’s football team. The real deal point that hits home the hardest about the debate is the word racist. Not racism; it’s the full-on, take it personally, title of racist. The idea that they have, for generation after generation, celebrated and cheered a term built upon the bloodied bodies of human beings is incomprehensible. It should be. After all, regardless of the mouthpieces who speak in support of it, another truth is that the majority of those team fans are really just your average, basic, decent citizen and neighbors. They’re the same people who’d help you shovel your walk; they’d rush to help someone in an accident. They send donation after donation to help people devastated by wrath of nature disasters. They’re the same people you’d likely enjoy a coffee with at a local school or church event. Like most anyone, they will move heaven and earth to protect and cherish their children and community. They will also do the same to protect that inner sensibility to remain good people. Good people are not racist. Therefore, that “R” word is the issue, but not really the term itself; it’s about the people who are changing their truth’s history of it. The campaign to bring out that ‘truth’ is everywhere. Social media is fully covered by various groups in support of the talking points put out by the team’s organization. They include the origin of the term, the number of teams with the name, the original honor intended, and so on. The team has put up a page on their website dedicated to the issue. There are constant interviews given by their P.R. reps in radio, podcasts, TV, and newspapers. The team owners created a charitable organization dedicated to the plight of Native Americans – although the altruistic intentions are vociferously debated given the timing of the new generosity and the requirement of highly visible team branding attached to what is given. The information available for the entire issues’s history is ample and readily accessible, and yet its existence is denied over and over. The engagement of hundreds of Native American tribes and groups is almost wholly ignored. The organization at the head of the issue, the Change the Mascot organization is never referenced. The irony in the labor to ignore the voices of Native Americans by declaring this is only an effort by white liberals serving a politically correct agenda is completely lost on them. They’ll state sadness and regret about the Trail of Tears, but if there is such a thing as opinion genocide, there is a good case for this being an example at work. How do decent people seemingly willingly embrace racism? How is all of this even possible by these same decent people of regular everyday life? To get an idea, we’d have to ask what it would feel like, within the dawning of the realization, that what Native Americans are saying, is true. What does the evidence of horrible realities behind nearly 80 years of mythical stories of supportive honor do to the average heart? What does it mean and what does it say about everyone who ever supported the team? What does that make every celebrating and cheering owner, employee, player and fan over those nearly 80 years? Despite a likelihood of racism within some of the mindsets, for the most part, for the rest, in a word, it would have to be: ignorance. We’re talking about mostly just ignorance. For over two centuries there has been a deliberate effort to hide the history of Native Americans with even more fervor than the attempts to silence them today. the demand to manage virtually every aspect of life on those reserves and reservations. The most the average citizen learned about Indigenous people amounts to pemmican recipes, tipi making, and how they caused great harm to the poor besieged settlers on their land. This is just fact, and in truth, because of that even many of the Indigenous peoples have yet to learn their own histories. So, it is in these cases, that we can say to people: we understand. We can’t condemn someone for racism unless they are informed and educated about the point of issue. To be sure, there has been a lot of informing going on and the aid of social media has been helpful in spreading the news even faster. There have been a good number of successful inroads because of this, but make no mistake, there is still a huge amount of ground to cover in North America. Thank you, to Mike Wise – Washington Post Sports Writer, for sharing this piece at CSN Washington Post. This entry was posted in Aboriginal Peoples, All-Time Top Ten, Indigenous, Indigenous Peoples, Life, NFL, Washington Redskins and tagged Change the Mascot Org, Native Americans, NFL, Racism, Racist, Washinton Redskins. Bookmark the permalink. I’m white middle-class European five generations down the since-my-ancestors-sailed-here period, and I still fell unwelcomed and threatened. I have descendants who are Japanese, Chinese, Jordanian, Indian, Polynesian and European. Quite frankly, I can’t understand why people don’t get on with life. Anyone who rejoices that Obama is black and a president is a racist. If they rejoice in it, it means they don’t regard humans as equals. I wish North Americans would stop this racists crap and quit spreading their bigotry all over the world. If one is proud of their North America 40,0000 year-old heritage celebrate it. But don’t crap on mine. No longer a follower. I’m sorry Robyn. I can understand the frustration with wishing everyone was already an equal and able to move freely and able, Bruce. I feel luckier than many of the people I write for because despite the horrible circumstances of my own childhood, I benefited in extra ways that allowed for an easier path. I don’t know how much about the Indigenous people you are aware of here, but most were required to live on reserves and reservations with a level of restriction that most citizens would never put up with, all the while having to pay for that with the resources extracted from their lands. Now this isn’t to say that all citizens of Euro-heritage, or any other heritages, aren’t working to alleviate the imbalances too, far from it. I don’t think I am saying anything outside of that. In fact, I would say they struggle in the work just as much as minorities in trying to alleviate the amount of injustices still prevalent in our societies. As as aside, my own Metis ancestry contains forefathers from Scotland, France, and England, so I would not consider myself crapping on them any more than anyone elses. By the way, the racism on display is not restricted to Euro-heritage either. I wish we already had all the answers as to why this mentality carries on, but as we’ve experienced, it doesn’t just go away, and so there is no getting over it, until we face the past as it was, and work through the consequences of that. That seems to take a few steps forward and a couple back every decade or so. The papers and commentaries here are very blatant in their disdain for people of various heritage. I’m sorry you feel offended by my views and efforts. It’s what I believe I have to do to help make the problem less of a problem..
Get over it. Start living today. When I lived in North Carolina the Native Americans on the “Reserve” wore feathered head dress. It wasn’t part of their tradition. They wore it to get money from the tourists. They sold their grandmother’s bones for am dollar. I have no respect for them. That’s nothing. The British slaughtered the Native people until some tribes were actually wiped out. That’s uncomfortably close to genocide. I have no respect for that. Then of course Hitler (a European of some reputation) killed 6 million Jews because he didn’t like them. I have no respect for that. Then, of course the Swiss (also Europeans) most recently were so determined to discriminate, that they held a public vote on banning Mosques. I don’t repect that. I could go on and on and on. Until people step up to the plate and say -“We did that and we wish to change.” there will be no change. You really are a jerk, aren’t you? Sad sad sad…. You are a racist, bigoted, genocidal jerk who should be deeply, deeply ashamed of your ingrained hateful personality. You know what bothers me most about this post Robyn? When I stand back and look at all that you’ve described and the resistance that’s been encountered. I am flabbergasted. All you are trying to do is take ownership back of a WORD that is derogatory of your people and culture. You want ONE WORD changed in it’s use. And every single solitary person knows and understands why that word is derogatory and has no argument against the fact that it is. From the sound of the battle, to a bystander with no story knowledge it would seem as if you are tearing apart families and exploding ordanance and destroying the very fabric of people’s worlds – threatening their very existence. I really have to wonder about the quality of choices poeple have made in what is important to their lives and critical to survival. 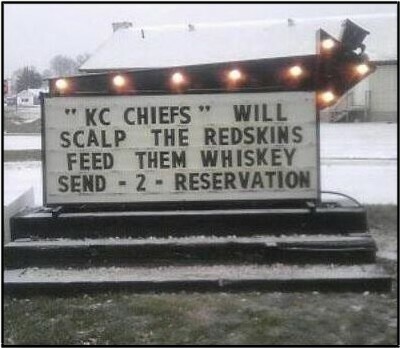 Or for that matter how hateful their use of that word is to those of First Nations heritage. The presumed caring and empthy of the populace is sadly missing. It says a lot about what we have become as human beings .And it is sad. We have built a civiliation of “ME”. No one wants to give up anything if it doesn’t please them – that truly has become the criteria for how many make decisions. It is almost as if the culture itself has become sociopathic. You know my view on this Robyn – we’ve discussed it before. If people won’t act “human” then take away their choice and legislate what is “right” or at least what behaviour is acceptable. That way it becomes personal for them, they either have to behave properly or be discipined by the law. A law that gives ownership of culturally sensitive words or phrases to the originating group – much like the many laws in Europe that regulate use of product names and terms. A sort of extension of copyright laws. That would allow First Nations to reclaim ownership of words and phrases which could then only be used in public with permission and even, if desired, for fees paid. See? Justice AND a revenue stream. Who could ever want for more? Ha! Great post as always Robyn. Very thought provoking. Thank You. I have to add, Robyn, that I started drafting the above response as soon a s you posted – hence (given the length) when I pushed “Post” it appeared with Mr. Goodman’s response preceeding. I did not rwad his response until after mine was posted. And yet he is a perfect example of the sociopathic, self-interested response of which I spoke. North Americans are “spreading” racism. That is so laughable i fell out of my chair with hilarity. Foreign cultures and races are being persecuted violemtly in Europe as we speak. Muslims, Middle Easterners, Africans, etc are all looked down upon with vigor in many coutries in Europe. A quick check of any European news media will find constant articles about this. Mr. Goodman is apparently quick to blame us for the evils of his own culture. A sure sign of an inability to address one’s own failures (narcissism). Further more, we rejoice that Obama is black, because it is a sign that his race has not deterred him form achieving the highest political position in the world – and that is a huge social achievement. We are not rejoicing his race – to each their own – but rather the perception of equality. Kind of like in the Bible where the shepherd goes after the lost sheep and when he finds it and returns, there is a celebration – even though hundreds of other sheep were never lost. A lost part of equality is seen to be found in Obama’s election. As far as “crapping on” his heritage, if the shoe fits wear it. Europeans and those of European descent are the largest racial. cultural group here and so any attempt to address racism has to involve them. Honestly denial of a problem is a sure indication of the “Me” generation and is antithetical to discovering a solution. Robyn your approach is so collaborative and cooperative, that I thought there was no way you could incense readers. Apparently I was wrong – again. It really highlights how bad the situation is. Thanks again, I’ve referred a couple of people to your blog and will continue to do so. Hopefully that makes up for the self-concerned deniers who will unfollow. Thank you, Paul. I do know your views and I have always appreciated your own measured and thoughtful responses with your eye for the overall picture. I’m always prepared for the possibility of dissenting opinions, (I’ve been well-trained by quite strong familial debates – LOL), but when it happens, it is somewhat saddening. I think I like to encourage thought in a way that’s about stretching current views. In any case, I can’t tell you how much your support means to me. I will also always deeply appreciate that even when you don’t fully agree with me, you give me reasoned views that encourage my own growth. There aren’t better friends than that. I think definitely awareness is the first step. Most people probably don’t get it at first- and you are so right- once you know, there are no more excuses. The hiding of how people have been oppressed makes it so easy for generations later to overlook because it’s all been concealed. I see parallels between what happened to the Native Americans and what has been happening to women. So many people are not aware– but hopefully all that is changing for both. Thank you Diahann. I’d been speaking on behalf of women for what feels like two centuries too. The idea that problems will just go away if we ignore them is a very old and worn-out and unsuitable solution. Like everything else, it takes genuinely facing it, and moving through it. That’s just too much work for too many who feel they will somehow lose something in the process. I think the real problem there is that they really have no idea of what it is that they think they’ll lose. Appreciated your presence here this morning, it’s kind of like a comfort blanket. No one likes to be wrong, or at least seen to be wrong, so I can understand why some folks would be incensed by your article. “Racist” is an ugly word, which is exactly the point. It’s an ugly thing. We have a huge problem with racism here, even though we’ve been a multicultural society for at least a century now. Our indigenous people have suffered, and I think even the racists have suffered too. They’ve diminished themselves in diminishing other human beings, so now they become something less than human too. Just angrier and more hateful. Hi Tony – I wholeheartedly agree with the point that most decent people would not like to be called racist. I have come up against a couple though who, very oddly, in my opinion, embraced the title. Whatever their fears about other people were based in, seemed to be quite deep, but not particularly rational. I also agree that anyone intentionally set on diminishing another person are themselves diminished, and that doubles the need for healing and setting their part of the world right. I wrote not too long ago about the need to look over our own fences as a lifetime learning process, especially because it has never been easier to do in this age of amazing technology. Thanks for your visit, I really appreciate your taking the time. This posting is very welcome because is seeks to address a major difficulty in writing anything about this issue. No message can be understood until it is placed in context. Mentioning football or mascots invokes the context of sports, which means that whatever is said next will likely be misunderstood, and certainly by sports fans. The true context is “Native American cultural appropriation as an example of implicit racial bias”. The average person thinks that Racism means overt speech or acts that show a conscious, intentional hatred. Applying the same word to unconscious, implicit thought or behavior is resisted even though it is the most usual form that racism now takes. The high-sounding principle of “belief in equality means being color-blind” is merely a way of saying “I have no biases” which is never true of anyone. Pointing to the rare times when implicit bias becomes manifest, as when opposing fans carry “Tail of Tears” signs, is the way to bring greater awareness. I certainly appreciate your visit and taking the time to note your thoughts. You’ve definitely pointed out good food for thought. If ever there actually was homage or honor bestowed by the naming of these sports teams, it’s long since lost. What’s in a name? It’s just a name. It bears no weight of the history of the team. The Washington Redskins or the Atlanta Braves were not originally Indigenous people and later opened up to integrate non-Indigenous players. No. They were white boys playing white boy games seeking to “evoke” the perceived power and strength stereotyped to the group’s whose names were stolen. Team names change all the time, though historically, I believe, those name changes were limited to when a team relocated, but the name changed nonetheless, and there’s no reason not to do that now. I get that there’s profit, merchandise, branding, all that financial-driven work that goes in to it, but the possibilities of a “rebirth” could bring a landslide of recognition and profit. Why not do that? Ride the train of compassion and use it to bolster the bottom line (because, let’s face it, when these teams do change their names it will be promoted as from compassion for the oppressed group). Thank you Melanie. As usual, your comment is full of thoughtful dialogue. There were once over 3,000 teams that carried that RS name and those number are down to less than a 1/3 of them now. There are plenty of cases to show no likely detriment to the team. If it’s a matter of profit, the team would likely enjoy a windfall in new merchandising efforts. It would certainly be more profitable than trying to compete with anyone who is now allowed to make and sell their team’s merchandise because their trademark copyright was revoked. I always appreciate your support of my thoughts and work Rachel. You know I have a deep admiration for your smarts, wisdom and compassionate views. I don’t understand it. If a name or word is seen as hateful to the people to whom it refers, why would you continue to use it? I’ll admit I used the ‘N-word’ as a kid, but I stopped when I found out I was hurting people even if they never heard me say it. The same is true with the “R-word”. It isn’t up to me to define how you feel about a word. I understand that it is expensive to re-brand a team, but we aren’t talk about the ultra poor, are we? How much does the NFL bring in? To think we live in a “post-racial age” is total ignorance. This isn’t the time or place for me to discuss it, but the stories I hear from my minority friends of daily occurrences are just heartbreaking. Native American culture fascinates me. I recently visited the new Native American museum in Washington and wish it were ten times the size. I agree that Americans need to know more about the Aboriginal people of the Americas. We need to know more of the history: the good, the bad and the ugly. I once read a book about Tecumseh, A Sorrow in Our Heart. It was educational to see the history of Ohio given from the Native point of view as opposed to the one I learned in school (though in New England now I grew up in Ohio). Although I think many of the worst examples of racism towards Native Americans are safely in the past, I agree with you that ignorance still creates huge problems. Hopefully the small trickles of information will eventually turn the tide toward greater understanding. Trent, you have shared so many thoughtful points here and there’s nothing I could dispute or add much to, outside of some serious issues that still need attending. At least we can say, there aren’t any bounties for bodies being printed in papers these days. I am more versed in the issues in Canada, but I’m sure there are many the same in U.S. Lot of work left to inform, and heal all around. On a personal level, I appreciate your grip on, and understanding of, the issue more than you can know. Thanks very much for your visit. I was at a fast food drive through, yes, it was a hard week and I did not pack food and I was in a hurry. I was in a drive through and behind a car with what looked like a brand new Washington Redskins license plate holder. I thought, if that were offensive to your race would’t you get pissed if I had that on MY car? I think people minimize things when it is not “their” race in question and this is sad. A brand new one? Was it on sale due to the scandal? Sad. Honestly as a child when I heard the term I did not give the history or connotations a thought, but if a group gets together and asks people nicely not to use a term, why not oblige? … and there you give the simple, to the point and heart of the matter. If someone is hurt by something you say and can explain why on top of it, why wouldn’t any decent person simply say, oh I didn’t know, won’t do it any more? Thanks for coming by, I always appreciate your words. It is my pleasure, I love to read the thoughts of Blog Woman!! !, another great post! Robyn, I can only say I’m glad you continue to post about this issue. It’s difficult to talk about. It’s difficult to own up to racist attitudes – they’re so ingrained from so early on. My husband still talks about the cowboys vs the “injuns” games he used to play as a kid – it was straight from the TV and books, nine thousand miles from your country. Nevertheless it reflects exactly what was going on – there was no mistaking who were supposed to be the baddies! Sometimes I’m outraged by it. Sometimes very ashamed. Sometimes resigned to it – this, I think, is the most dangerous. I remember weeping when I first read Bury My Heart at Wounded Knee. I was only seventeen and living in the States at the time. It changed how I saw everything – including the situation of indigenous people in my own country. I think the only way forward is what you are doing – keeping the matter out there, keeping the dialogue going, and meeting racism and/or hate wherever we encounter it, with reasoned discussion. In the end we are all people and understanding and respect is possible. Robyn, I came back to add that I’m from the same country as your first commentator. Despite what he has said our history is littered with dreadful, dreadful atrocities against indigenous Maori. It wasn’t all a one way street by any means – but the European colonisers ended up with the land, often taking it by force. You will know and understand the legacy of that! Maori were almost wiped out. Partly by European disease, partly by other effects of colonisation. While there has been a renaissance and some good things are happening, I don’t have to look far or hard to see the ongoing legacy of our history. Jill – I can’t believe I forgot to mention that when we were kids playing cowboys and indians, guess what? We didn’t want to be the ‘injuns’ either!! Jill, thank you so much for your support and encouragement. Your own story of attaining a more informed understanding of the history is the whole point of my own efforts. I know that so much of the issue in general, is that too little is known about the historical & current truths. Education on a continental basis is absolutely required to track-back centuries of misinformation. It’s been through these posts and comments here and on Twitter that have widened my own knowledge of the world-wide histories of Indigenous Peoples. I have had quite a mittful of NZers write me in comments or email to express their own stories or views. It’s also true that I have lost a number of followers because I do speak to these issues, mostly on a less than monthly basis, but that’s more than enough for some. It’s kind of ironic, given they have, or had, commented quite favorably on any number of my previous posts speaking to compassion and efforts to understand one another. In any case, the majority of people, my followers, or the general populations remain or become, understanding and respectful when they learn the details of these issues. I am grateful to count you as one of them. I have seen racism in action. I’ve never understood the motives but I’ve seen the affect. Why anyone would want to defend a racist approach is beyond my understanding. Maybe if enough people talk about this issue in a thoughtful manner as you have done here, things will eventually change. Unfortunately, I doubt things will change soon enough. Thank you, Dan. With age comes a little more willingness to take the time to consider how things have come to be the way they are. There are times when I certainly feel a knee-jerk angry reaction to certain statements or actions, but I realize that along with anger, there is more of a need for patience to undo centuries of indoctrination. I hold high hopes that the speed of communication now will help to reverse the majority of that sooner than the centuries it took to feed it. I hope.